Enter Bob Vila’s 4th Annual $3,000+ Kitchen Appliance Giveaway Today! Enter today and every day this month for a chance to win your choice of six amazing prize packages. Get your holiday season off to a smashing start with some new kitchen appliances that will make it easy for you and your family to be the hosts with the most! This season’s rapidly-approaching Thanksgiving holiday and the right-around-the-corner Christmas, Hanukkah, Kwanzaa and New Year’s celebrations mean you will have ample opportunities to show off your culinary chops—especially with some brand new kitchen items designed to make food preparation a snap. To help you along, we’ve teamed up with Cuisinart to bring you the 4th Annual $3,000+ Kitchen Appliance Giveaway, which will award four winners their choice of one of six packages—perfect for cooking up cherished family recipes and new favorites. Cuisinart has been synonymous with the culinary craft for more than 45 years, specializing in easy-to-use, high-quality kitchen appliances and serveware that are relied upon by professional chefs and amateur cooks everywhere. 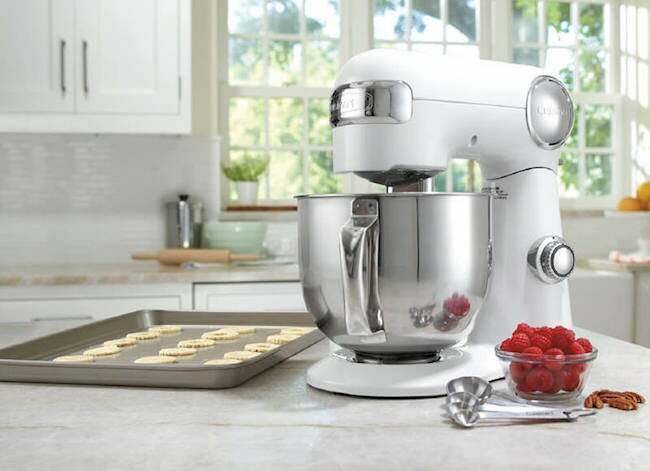 The brand’s ubiquitous food processors have won high praise from the likes of chefs James Beard, Julia Child and Jacques Pepin. Its full product line, also highly awarded, includes cookware, bakeware, coffee makers, blenders, mixers, juicers, slicers, tools, gadgets, toasters and serveware that are all designed to make home cooking a truly memorable experience. To learn more about Cuisinart and their innovative kitchen products, click here. The Healthy Foodie Package: Cuisinart Air Fryer Toaster Oven; Custom 14-Cup Food Processor; Electronic Yogurt Maker; Compact Juice Extractor; Smart Stick® Variable Speed Hand Blender; Food Dehydrator; Prepexpress™ Slicer, Shredder And Spiralizer; and Pineapple Slicer. Good Morning Beautiful Package: Programmable Espresso Maker; Coffee Center™ 12-Cup Coffeemaker And Single-Serve Brewer; Breakfast Express® Belgian Waffle & Omelet Maker; International Chef™ Crepe/Pizzelle/Pancake Plus; Cuisinart Automatic Cold Brew Coffee Maker; Classic 12-Cup Percolator; and Grind Central™ Coffee Grinder. Bake, Baby, Bake Package: Hurricane™ Pro 3.5 Peak Hp Blender; Cuisinart Precision Master 5.5 Quart Stand Mixer; 2-lb Convection Bread Maker; 6-Piece Bakeware Set; and Cooking Torch. The Backyard Carnival Package: Hurricane™ Pro 3.5 Peak Hp Blender; Kettle Style Popcorn Maker Trolley; Kettle Style Popcorn Maker; Snow Cone Maker; and Cotton Candy Maker. Holiday Hostess Package: Cuisinart Cordless Electric Knife Set; 6-Quart Pressure Cooker; 6-Quart 3-in-1 Cook Central® Multicooker; Electric Skillet; Chef’s Classic™ 11-Piece Conical Stainless Steel Induction Cookware Set; Irais 45-Piece Flatware Set; Can Opener; Cheese Knife; and Stainless Steel Ladle. Enter Bob Vila’s 4th Annual $3,000+ Kitchen Appliance Give-Away daily to increase your chances of winning one of these amazing packages! “Bob Vila’s 4th Annual $3,000+ Kitchen Appliance Giveaway” is open only to permanent legal U.S. residents of the 50 states and the District of Columbia. Void in all other geographic locations. No purchase necessary. Void where prohibited. Contest Period for Prize runs from 12:00 p.m. (EST) Wednesday, October 31, 2018 through 11:59 a.m. (EST) Friday, November 30, 2018. One entry per household per day on BobVila.com. Alternative means of entry for Drawing is available by faxing your name and address to 508-437-8486 during the applicable Entry Period. Odds of winning depend on the number of eligible entries received. See Official Rules.